It’s Twitter Tip Tuesday — every Tuesday we’ll focus on one Twitter Tip and show you how to integrate it into your social media strategy. This week we’ll show you how, and why, you should pay attention to Twitter Trending Topics. If you’re reading this article, you’re probably interested in using Twitter to promote your business. 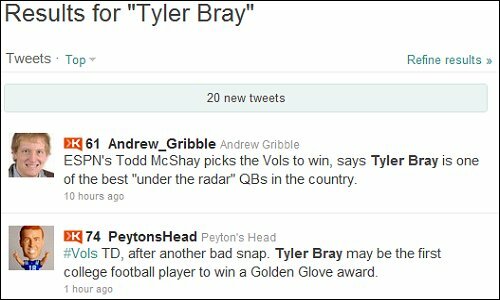 So, you might be wondering how Twitter Trending Topics like Tyler Bray, or #takewallstreet could possibly be relevant to you. The following article will explain what Twitter Trending Topics are, and how they can be a useful part of your overall Twitter strategy. What Are Twitter Trending Topics? Twitter Trending Topics are topics that Twitter deems to be the most popular, real-time conversations on Twitter. Topics, keywords, or hashtags that are mentioned most often get listed in a column called “Trends.” All of the topics, or Trends, are hyperlinked. Click on any trend, and you’ll see all of the tweets that are associated with it. You can favorite, retweet, or reply to any of the tweets listed in a Trending Topic. Use the exact keyword or phrase from any trending topic in your tweet, and it will appear in the topic’s timeline. Twitter tracks Trends from all over the world, and categorizes them by country, and city. You can change the default location for Twitter Trends by clicking on the “change” link just to right of the word “Trends,” and selecting a country from the pick list. 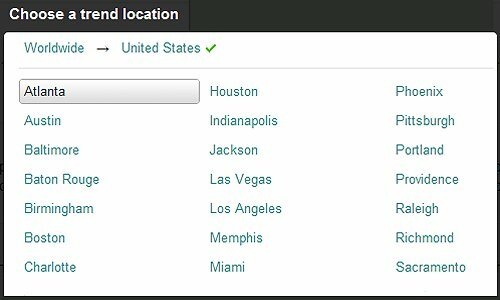 If there are enough tweets from a given city to justify a Trend, Twitter will list that city in the pick list as well. Topics will not be promoted to a Twitter Trend unless hundreds of thousands, or perhaps millions of people, mention the same topic in their tweets — at roughly the same time. The topics themselves are promoted on Twitter’s home page, and anyone who clicks on a topic gets a real time view of the tweets that mention it. In other words, by using a topic’s keyword in your tweet, you expose that tweet to a potentially huge audience. Ironically, Twitter looses its effectiveness as a business marketing tool if you tweet about nothing other than your business. Use Trending Topics to find and follow people who share the same interests as you. Strike up conversations and engage fellow tweeters; this is one of the best ways to show there’s a real person behind your brand. Don’t be afraid to tweet about Trending Topics that are humorous, or entertaining. Sometimes it takes having a little fun on Twitter to remind you why you got involved with social media in the first place — to connect with people (and customers) on a more personal level. Do you follow or comment on Twitter Trending Topics? Have you made any lasting connections as a result? Share you thoughts in the comments below.